Each fall during migration, large flocks of Sandhill Cranes congregate in agricultural fields to glean waste grain. Nearby wetlands, including sandbars on the Wisconsin River, provide safe roost areas for the night. Sandhills are generalists – adapting to a variety of situations for feeding, nesting and roosting. They are more tolerant of human disturbance than our other North American crane species, the Whooping Crane. In rural Sauk County, observing these sizeable flocks from the car is of little consequence to the birds. Juvenile Sandhills (above) lack the bright red head of the adults. In an average year the cranes have moved on by mid to late November, but in 2011, Ted and a friend counted more than 5,000 Sandhill Cranes during the Audubon Christmas bird count in December as they flew in to roost on the Wisconsin River. Photos by Ted Thousand. All rights reserved. I was just asked to be in a show by Richard Moninski, owner/artist of Green Lantern Studios in Mineral Point, WI and a lecturer at UW- Plateville. An opportunity was available for the gallery at UWP and he asked another fiber artist and myself to exhibit. I met Richard and his wife, Carol Spelic – also an artist, years ago through a mutual friend, and have had some pieces in shows at their gallery. This venue is much larger, though, and he asked for everything I could spare, the larger the pieces, the better. I was just starting a new Sandhill Crane piece and fortunately got it finished the night before I had to deliver the work. It’s 65″ wide and is a life size crane in flight. I will take more photos of the piece hanging at the gallery in the next couple of weeks, but for now you can at least see a portion of the bird. The crane is hand painted and screen printed with the plants and animals present in its environment – both good and bad. It’s appliquéed to a piece of silk jacquard that was shibori dyed, and I’ve done the free motion stitching between the images with silk thread. The eye is fabric paint and powdered mica, giving it a golden shimmer. 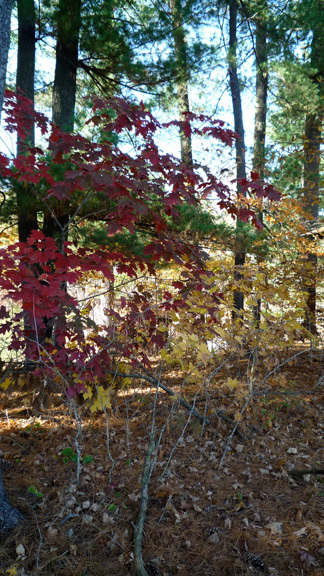 The exhibit, Nature, Explained, will be up from October 31 – November 22, 2011. Pat Kroth, a fiber artist from Verona, Wisconsin, will also be exhibiting. 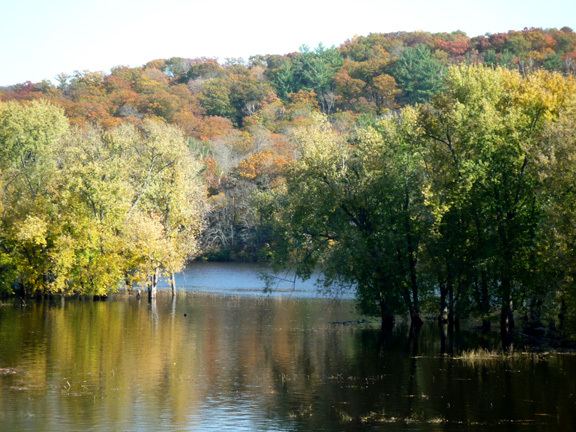 In early October I was in Minneapolis for a web workshop and thought I would take the opportunity to visit the St. Croix Watershed Research Station in Marine-on-St. Croix, Minnesota. In August of 2008 I spent a little more than 3 weeks at a cabin, Pine Needles, owned by SCWRS and used for their Artist in Residence program. The front of the cabin faces the St. Croix River and is quite secluded, with the exception of weekend canoeists. 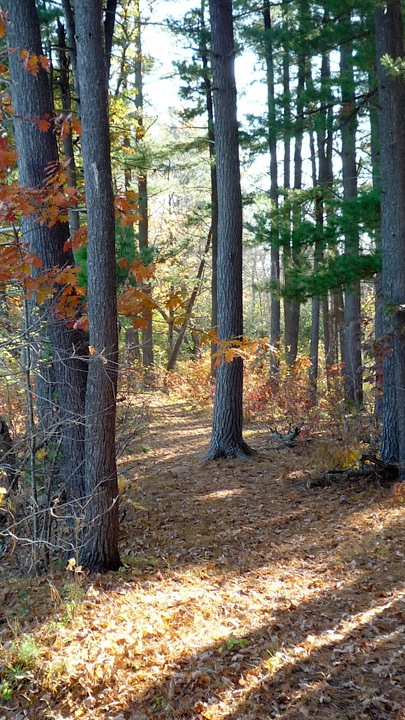 This photo shows a footpath that runs east from the cabin about 1 mile to a small town called Marine-on-St. Croix. The SCWRS is about 1 1/2 miles beyond town. The folks at the research station graciously allowed me to stay at Pine Needles for a couple of nights on my way back to Wisconsin. The difference in the river was remarkable. In 2008, the river was so low that boats had to be dragged across impromptu sandbars in front of my little house. This year with water levels 8-9 ft higher, the island just out front of the cabin was completely submerged. 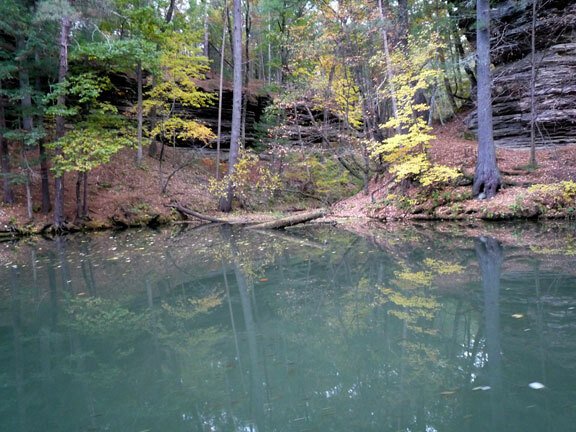 Here you can see the lower limbs of the trees are just touching the water. The beautiful color in the background is Wisconsin. Hard to believe these trees survive being submerged like this 2-3 times a year. Harder still to picture canoes, tents and campfires on an island under the trees. I was with a friend from work and we were very lucky to be able to visit on a weekend with perfect weather at peak fall color. Everything was frosted this morning from the fog that developed last night. Hoar Frost develops on surfaces by direct condensation at below freezing temperatures. The crystals form little needle shaped structures giving trees and shrubs – or anything outside – a feathery and delicate appearance. 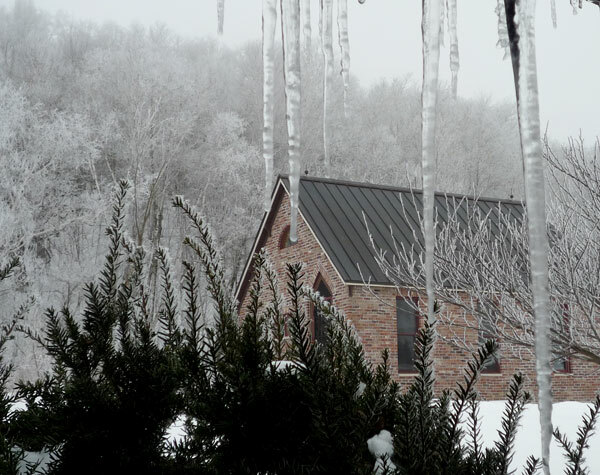 This pic of my studio is take from the back deck of my home, past the icicles hanging from the roof. Tonight’s forecast calls for even heavier fog, which should mean another surreal winter landscape tomorrow. I’ll head back to the studio to continue work on several projects including a scarf I’ve been planning for a long time. 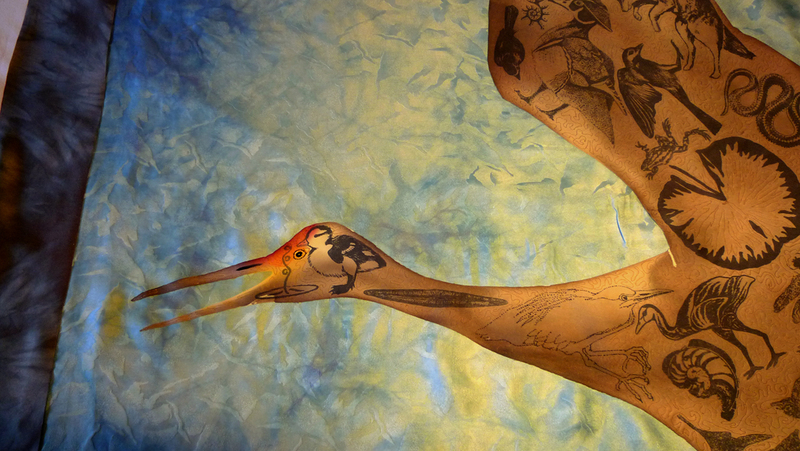 These silk scarves will picture all 15 of the world’s cranes. 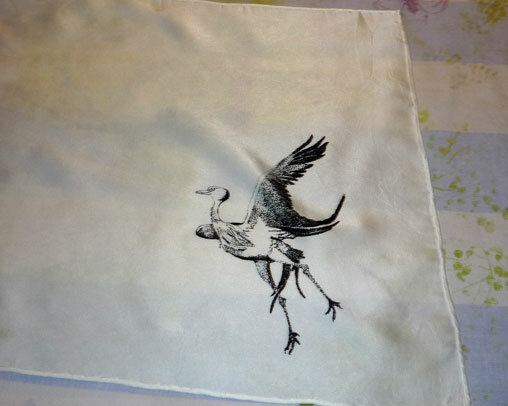 The version I’m working on currently shows each crane printed in black and hand colored with thickened dyes. Tomorrow I will steam set what I’ve done so far and then decide what to do on the background. Here are some photos of the process. 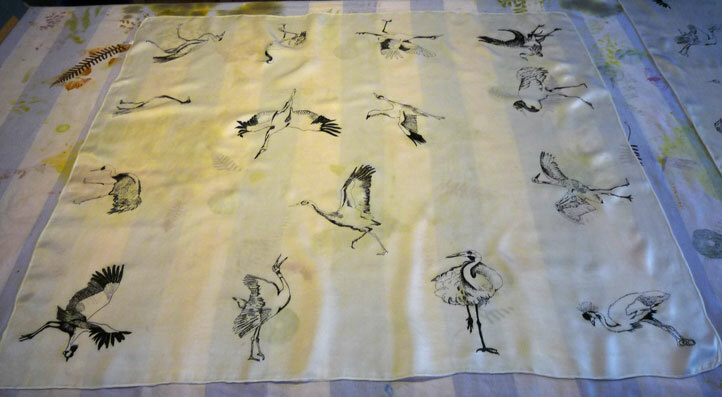 A drawing of each crane was placed on the scarf so I could position my silk screens correctly. 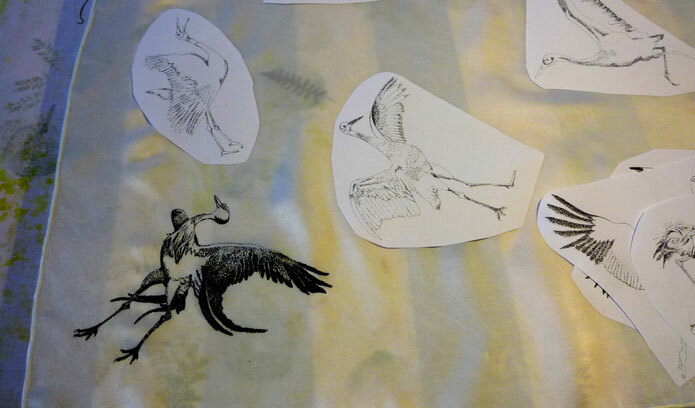 Tomorrow I’ll post the results of the hand colored birds after they’ve been permanently set on the silk. This was just too good to keep to myself. 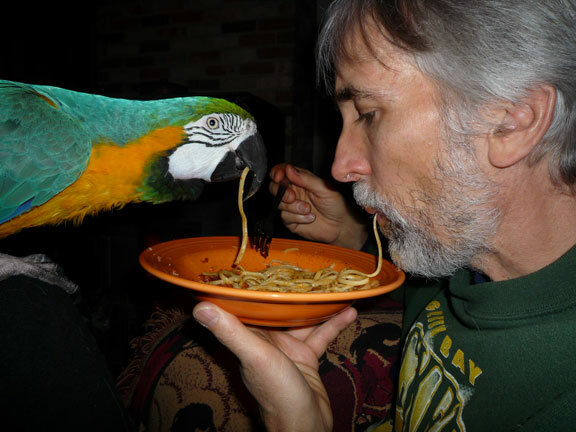 Not sure who’s who, but Ted and Rudy seemed to enjoy the linguini with matched enthusiasm. I promise to return to the original intent of this blog soon. This little black-capped chickadee flew into the window of my studio the other day while I was working. Fortunately he was just a little stunned and after I held him for a few minutes, he flew into this snag of blackberry brambles to finish his recovery. This female Whooping Crane has been in the Amoco Whooping Crane exhibit for the past two seasons. She and her mate built several nests in the Spring of 2009, but no eggs! Hopefully 2010 will prove to be more fruitful. Both she and her partner were some of the last eggs to be collected from the sustaining flock’s nests in Wood Buffalo National Park, Alberta/NW Territories, Canada. In 1941, only 15 Whooping Cranes existed on the entire planet. It was not until 1954 that the nesting grounds of the tallest flying bird in North America were discovered at Wood Buffalo. Fortunately, a wildfire fighting plane was surveying the region and when one of the firefighters looked out the window, he saw these large white birds sitting on nests. The Canadian and American governments moved quickly to send biologists into the nesting areas and retrieve eggs to establish a captive population of this critically endangered species. Today there are a little more than 500 of these majestic birds living – including both wild and captive flocks.